If our reality is an illusion (let's suppose it is) and we can, one day, have the technological means of creating yet more (virtual) illusory worlds into that illusion (let's assume we can), one might ask, "has it happened before?" and then, "how many times?" 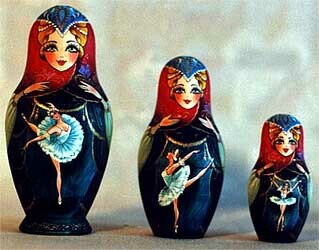 And if so, "How many layers are there to those elaborate reality Nesting Dolls?" "Eternal night, strange skyscrapers that morph from the ground, while the unknowing citizens get their memories changed every 24 hours. This is a surreal, bizarre and effectively paranoid sci-fi thriller that will please the neo-noir fans. Unlike most of the films of its genre, "Dark City" does not have any action sequences or endless gunfights. It is more like a dark and moody meditation. What makes us human? What is individuality? Is it simply a collection of memories that make us what we are? Will a man that has got memories of a killer continue the horrifying practice? Or is it something deeper, something you cannot change, take or label? Is that what we call soul?" ----Alex Loshpe, "all-reviews.com"
11 May 2003 @ 01:17 by shawa : Pinch me! We can´t ever know, because what we call "reality" is projected by the brain, and we can only see the contents of the brain itself. I live in the mountains, and I only see trees. Do you think the trees still exist when I´m not looking ? I can imagine it "clean and organized" and it will clean itself! all the threads that have somehow magically migrated from the upstairs studio to the downstairs rug are illisions? Hurray, hurray, no vacuuming today! Mark loved Dark City so much that it is in our movie collection. And through these energies we create connection to each other. I can now mentally do things I could only (so I thought) physically do before. Very synchronistic Francis.I ran into one of these nested dolls just last week, which looked much like the ones above. Having been thinking about the question we all ask ourselves,(what's it all about? ), i had a vision of the universe as a giant human being, with the planets and suns and galaxies actually being cells and atoms and us being the quarks,strange, charmed and the rest. Wouldn't it be strange if when you opened the innermost doll, the biggest was inside.Thinking of nested dolls and mobius strips is certainly food for thought eh? I came to NCN 16 months ago for the sole purpose of finding someone who can show me the way to Shell Beach. Francis, how do I get to Shell Beach!? Turn left at the Muse? And then... ah, but no. I think you go right at that big... I need a taco. The best I can do these day is to rearrange my brain so as to get a bearing on my position within the doll : ) . There are plenty of nested illusions at work, to be sure. The ones I can actually see are going to take plenty of energy to overcome, so I can only worry about the ones I CAN'T see so much, you know. But yeah, one does really wonder. How would we go about "waking up" from such things? I know some people will tell you to meditate a lot, but I'm afraid I don't buy that one. *Sigh*... big question. ...not seeing something is not a proof that it doesn't exist. It would then follow that, for a blind man, nothing exists. If I stand out in the woods and say something---and my wife is nowhere around to hear me---is what I say out there still wrong? you are saying Jazz and if you would consider it "wrong". Any thought, in any form goes out into the universe to be picked up by the "right receivers. Maybe your wife might not want to recieve what you perceive as "wrong". She may tune you out!!! 12 May 2003 @ 08:40 by jstarrs : Martha..
are women giving you a hard time again ;-(, Dr....Nurse...a pill for this one please. give him one of those "woman are lovely creatures" pills...yes..the pink one. just another example of the complexities of a woman's mind. My, my, the man ripples easily sometimes. How thoughtful of swan to have the correct pill. Maybe she is Nurse Swanetta in disguise. 12 May 2003 @ 12:27 by martha : tuned into me are you? The rest of them have to pee on the electric fence. 12. AND FINALLY: After eating an entire bull, a mountain lion felt so good he started roaring. He kept it up until a hunter came along and shot him... The moral When you're full of bull, keep your mouth shut. Fifth, You know you are getting old when every thing either dries up or leaks. Tenth, Long ago when men cursed and beat the ground with sticks, it was called witchcraft. Today it's called golf. And finally, If you don't learn to laugh at trouble, you won't have anything to laugh at when you are old. A few pointers from above that do stand out. I assume this is TRUE also.